To look into the increasing popularity of small and personal luxury cruises in 2009 we headed to Scotland to sample a cruise along the Great Glen, from Inverness towards Fort William. The route took us through the eerie blackness of Loch Ness, along the rivers Ness, Spean and Lochy and the 29-lock Caledonian Canal on the luxury barge the ‘Scottish Highlander’. 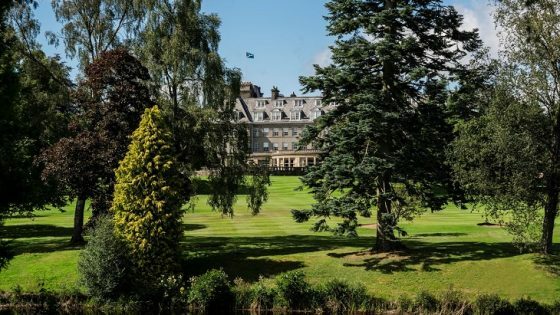 The scenery in this area of Scotland is stunning and visits to historic sites such as Glencoe, Cawdor Castle (setting for Macbeth) and Ben Nevis were all included as part of the cruise. During the week long cruise the barge slowly traversed the Caledonian Canal stopping at Loch Ness, Fort Augustus, Laggan, Gairlochy and Fort William. At each of the stops a tour of the nearest attractions was arranged in conjunction with passenger preferences and the weather. The barge carries six mountain bikes onboard for guest use as well as a Zodiac-type boat for excursions, fishing tackle for fly-fishing opportunities and binoculars for wildlife study and bird-watching (golf was also possible). The Scottish Highlander is a 200 tonne Luxe motor barge that was originally built in 1931 in Holland. 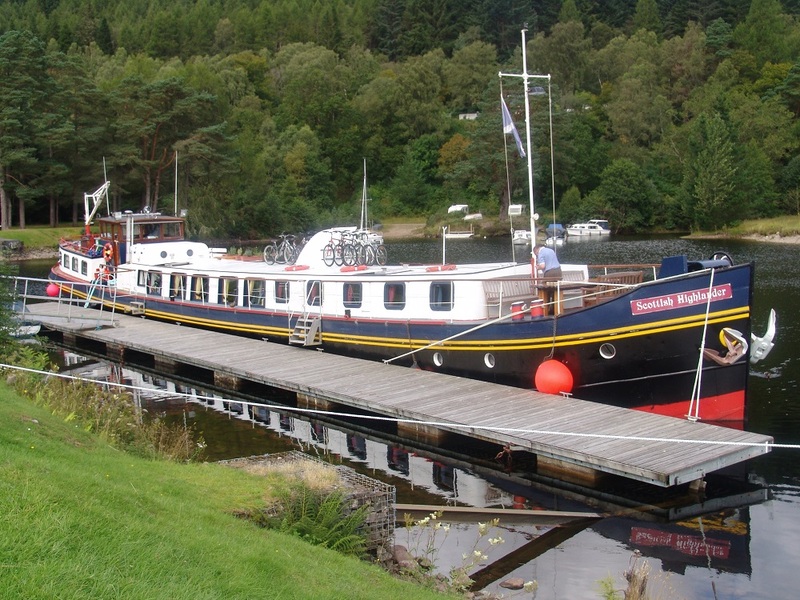 The barge was renovated in 1991for use as a hotel cruiser and transferred to Inverness, Scotland (she began to carry passengers in April 1993). 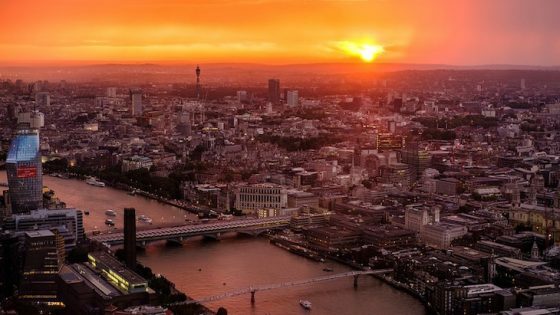 In 1999 the barge was acquired by European Waterways and again refurbished in 2006 to a luxury standard, rechristened as the Scottish Highlander and began a career as a luxury cruise barge. She is 117ft long with a beam of 16.5ft, a height of 11.5ft and a draft of 4.6ft and can carry eight passengers in three double/twin staterooms (115ft²) and one suite (150ft²) situated below deck. The upper deck has a forward sitting area for passenger use, while the aft area is occupied by crew cabins, the wheelhouse and the galley. The barge operates with a crew of four including the captain, a chef, a tour guide and the front of house hostess with a leisurely cruising speed of 4 knots and a maximum speed of 10 knots. 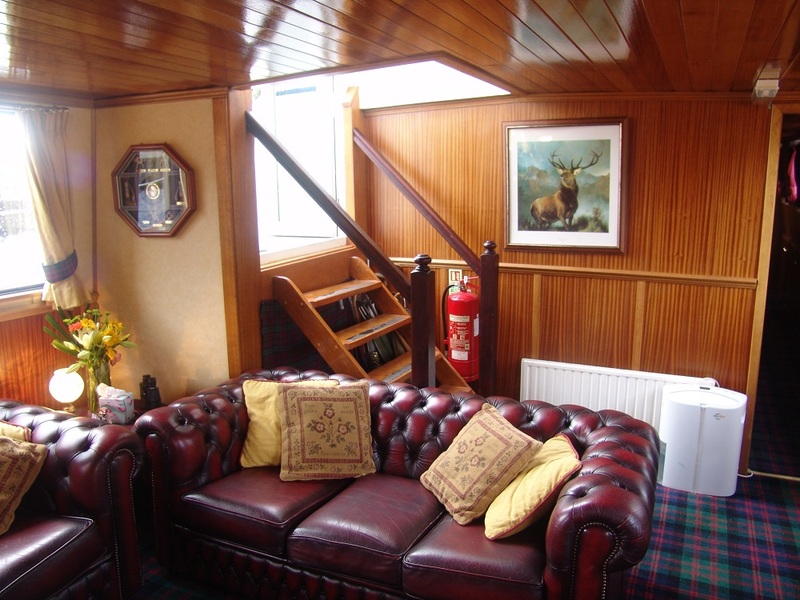 The social centre of the Scottish Highlander for the passengers is the main saloon which has a bar and the galley at one end with a polished walnut dining table set for eight (wooden chairs upholstered in blue velveteen). The other end of the saloon has red leather chesterfield style club chairs and sofas along with dark wood occasional tables, reproduction brass lamps, fresh flowers and coffee table. The salon has large windows all around providing natural lighting during the day and seven brass/frosted glass wall light fixtures for evening lighting. The walls and ceiling of the salon are panelled in a light sapele, with a mahogany dado rail and coving. They are adorned with nautical displays as well as black and white prints of the Caledonian Canal and marine charts. One wall also had the great Scottish cliché — a print of ‘The Monarch of the Glen’ by Landseer. The floor is covered in a blue and green tartan plaid carpet but there is also light yew wooden flooring in some areas. The room always has several current newspapers laid out for guest perusal each day and a small library for guest use (books and CDs) along with some board games and a stereo system. At the galley end of the salon a sideboard is laid with Scottish tea time treats and a selection of fruit. 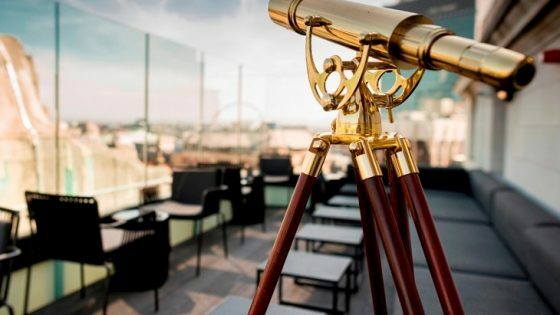 The bar is included in the price as well as unlimited fresh tea and coffee throughout the day with a coffee machine on standby as well as a full size water cooler. Guests arriving are met with a champagne reception and high tea is served every day accompanied with freshly baked scones and sandwiches made from homemade bread The food onboard was superbly prepared (using fresh Scottish produce) and accompanied by an excellent selection of wine and single malt whiskys. The three double cabins were decorated to a high standard with a similar mahogany and sapele panelling effect to the saloon. 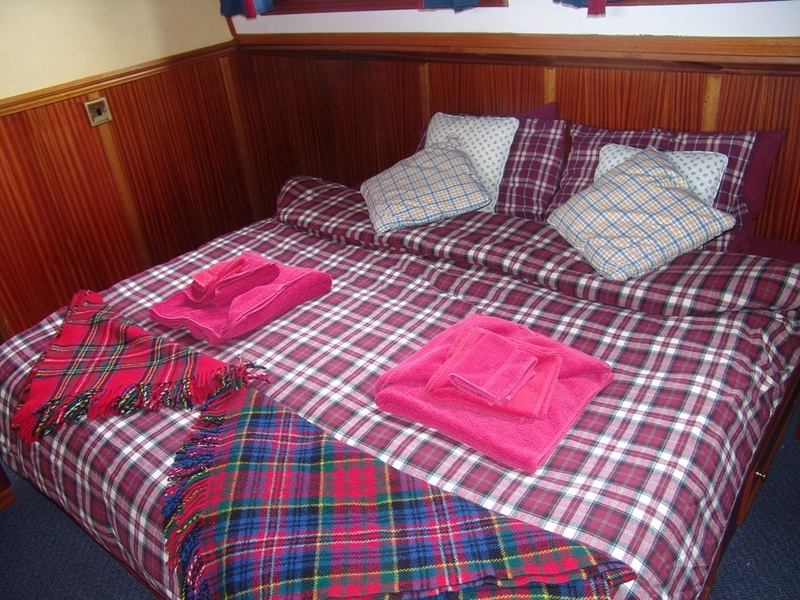 Beds were made up in red/blue plaid tartan duvets and blankets. The cabins gave ample space for conversion from two singles to a double bed and there was plenty of closet space, with storage drawers under the beds as well. There were two portholes one of which could be opened. The dark mahogany bedside tables were equipped with reading lamps and gave a good spot to rest a glass of water and a book in the night. Fresh towels were provided each day along with mineral water, shortbread and miniature chocolates. Cabin walls were decorated with typical ‘knots and yachts’ pictures. The bathroom facilities contained a shower, corner fitting white toilet cistern and were finished to an excellent standard. Antique style brass taps on the wash hand basin, cream ceramic tiles on the walls and brass fittings were functional and comfortable. In addition the bathroom had shelves for complimentary toiletries and a good sized mirror. The three cabins and the larger suite were named after famous Scottish clans with the Fraser, Macpherson,Cameron (suite) and Mackintosh coats of arms on each door along with the family tartan and motto. This was a well appointed and comfortable barge with something for everyone, incredible food and a real compliment to Scotland showing just how much there is to see and do in that wonderful country.